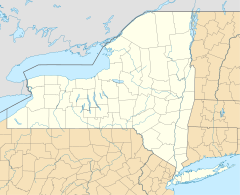 Kring Point State Park is a 61-acre (0.25 km2) state park located on the St. Lawrence River in the Town of Alexandria in Jefferson County, New York. The park is north of Alexandria Bay near the St. Lawrence County line and is connected to NY 12 by Kring Point Road. The park was established in 1898 as part of the St. Lawrence Reservation. Open from the last Friday in April through Columbus Day, the park offers a beach, a playground, picnic tables and pavilions, recreation programs, a nature trail, showers, fishing and hunting, a boat launch, a dump station, a campground for tents and trailers, cabins and cross-country skiing. ^ a b "Kring Point State Park". NYS Office of Parks, Recreation & Historic Preservation. Retrieved August 16, 2016. ^ a b "Section O: Environmental Conservation and Recreation, Table O-9". 2014 New York State Statistical Yearbook (PDF). The Nelson A. Rockefeller Institute of Government. 2014. p. 673. Retrieved February 25, 2016. ^ a b "The St. Lawrence River Park". Fourth Annual Report of the Commissioners of Fisheries, Game and Forests of the State of New York. Wynkoop Hallenbeck Crawford Co., Printers. January 20, 1899. p. 124. ^ "State Park Annual Attendance Figures by Facility: Beginning 2003". Data.ny.gov. Retrieved August 16, 2016. This article about a location in Jefferson County, New York is a stub. You can help Wikipedia by expanding it.